The Weslo Cadence G 5.9 treadmill is definitely designed for very light use. That is, if you plan to just walk once a day and do nice easy workouts, this one will be just fine. However, for anything more serious, you'll probably be better off with other options. Still, the G 5.9 remains a very popular choice, and if you only have about a $300 budget, it's one of the better ones available. The blue-tinted LCD with Priority Display has readouts for time, distance, speed, and calories burned. Six workouts designed by a Personal Trainer automatically adjust speed and incline while you walk, which is a nice touch. Check out the popular Cadence G5.9 on Sale at Amazon Now! The Weslo Cadence G 5.9 treadmill has a manual incline for flat and elevated walking, a 10 mph top speed, and a heart rate thumb sensor on the dashboard. Another feature is the Comfort Cell™ Cushioning, which isn’t as impressive as it sounds; you likely won’t really notice any extra deck cushioning at all while walking. You should know that the treadmill motors that Weslo uses indicate the peak horsepower only and not a Continuous Horsepower (CHP) rating. You can read about that in the manual. This means the motor is about half the size physically than you think it is. Because the motor powering the Weslo Cadence G 5.9 is so weak (actually delivering only about 1 to 1.25 horsepower continuously while moving the belt), it’s advised by professionals that you ignore the max user weight. At best, a user should not weigh more than 160 to 170 lbs on this machine. Note that the up-level R 5.2 has a slightly more powerful motor. Treadmill reviews are generally mixed on many Weslo models, although we must note that this one is the #1 ranked best selling treadmill on Amazon at the moment. There are over 3200 reviews there, so you can read what users have to say about the treadmill. Some folks seem to be doing just fine with using them 3 times a week with no problems, while others who want to walk an hour a day every day, or have multiple users in the household workout on it, are reporting that these sub-$300 treadmills don’t last for more than a year, if that. Some of these motors are burning out at 5 or 6 months, and good luck with trying to get replacement parts from Weslo. So the bottom line here is that the Weslo Cadence 5.9 is a step up from a manual treadmill, but not a huge step up. You get folding capability, you get some incline, you get some degree of cushioning and there are some built-in workouts. This is strictly a walker's treadmill and nothing more, so make sure you keep this in mind as you consider it. 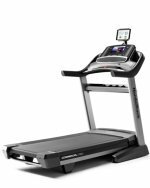 How Does the Cadence G 5.9 Compare to the R 5.2 and Other Weslo Treadmills? As we mentioned, the G 5.9 is definitely the most popular Weslo treadmill on the market today, and has been for quite some time. It's cheap, it's easy to use, it's got a few built in workouts...it gets the job done. All of their machines are quite similar, but you might be wondering how the Cadence G 5.9 compares the the other Weslo models. There are currently 5 models altogether, including four in the Cadence Series and one in the CrossWalk series. There used to be many others but the numbers have dwindled over the last few years. In addition to the G 5.9 and the G 5.9i (which just adds a tablet holder and nothing else) the next most popular model in the series is the Cadence R 5.2, which is quite similar to the G 5.9 in many ways. The R 5.2 gives you the same large LCD window, 16" x 50" deck, 0-10 mph speed, 2 position incline, SpaceSaver design and Comfort Cell cushioning. It does however have a different motor, a 2.5 HP Impulse Max Motor, a lower max weight capacity of 250 lbs. and just a 90 day parts and labor warranty...nothing on the motor. So the G 5.9 is a slightly better option. The top of the line Cadence treadmill is the G 7.0, but it is possible that this model has been discontinued as we could not find it for sale while doing our Weslo Cadence G 5.9 review. Just for kicks though, that one lists for just under $2,000 (as opposed to $399 on all of the others) and really doesn't give you much more than the rest of the Cadence Series, which is odd given its steep price. All you get is 10% power incline, instead of 2 manual, and gives you 8 workouts instead of 6. You still get the same small belt, weak motor and low max weight capacity...so why is it so expensive? 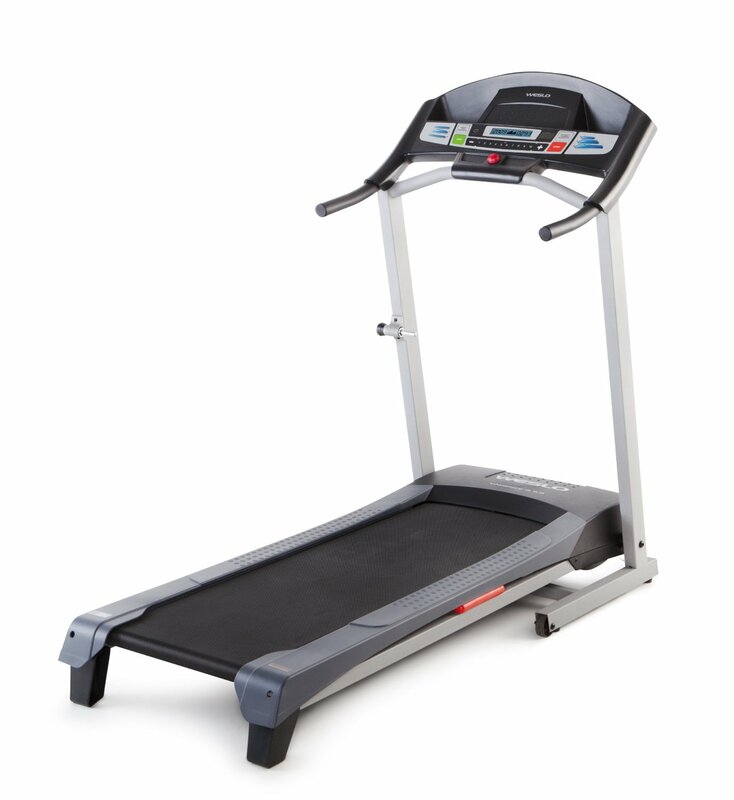 Here you have the Weslo CrossWalk 5.2t, another treadmill that may be discontinued by the time you read this. This one has the least features of all, with a weak 2.25 HP motor, even shorter 16" x 47" deck and even fewer workouts built in...only 4 as opposed to 6 and 8 on the others. So as you can see comparing the Weslo Cadence G 5.9 to the R 5.2 or any others in the lineup doesn't really help you make a decision. They are all pretty much the same entry level low grade machine, with a few minor differences. Our suggestion? If you want a Weslo treadmill go with the G 5.9. It's the most popular, there are plenty of reviews to read, and heck it's cheap enough that you can throw it out in a few years. Even with the low price and free shipping (a savings of about $85), it’s impossible to wholeheartedly recommend a Weslo Cadence G 5.9 treadmill. It actually has a more attractive look than other Weslo models, but with the flimsy design and weak motor there’s no point in taking a chance on this one. We suggest you budget a little more and get a machine around $700 to $800 minimum, which will give you reliability, durability, and value. It is a lot more to spend, but you want a treadmill to last 5 or 10 years, not six months. However, you can also look at it another way. If you need something very simple, or you are rehabbing an injury, the Weslo G 5.9 could make sense. Paying under $300, even if it lasts a year or 6 months, at least you're not throwing away a lot of money. But definitely opt for the extended warranty if it is available to cover yourself past the original coverage, just for peace of mind. Get more information and read all of the user reviews on this treadmill here.